Listening to music on our iPhones is one of the most classic uses for the device. The Music app has been with us since the beginning, in the form of the old iPod app. It has gone through a few iterations and improvements throughout the years, but there is always something that third-party apps are doing differently or better. Feedback, by Ron Thakrar (@ronthakrar) enables audio and haptic feedback for media controls. It only works when controlling audio playback remotely, like in the Control Center or Lock screen. For example, it doesn’t work within an app itself, when you’re in the Music app and press play or skip track it won’t make any feedback sounds. There is a lot of themes in Cydia, many of which don’t get as much attention as they might deserve. A lot of hard work goes into the thought process of creating a coherent design. It has to make sense and look good. Noir, by Roberto Alvarez (@0phicleide) was born out of his desire to have a clean-looking minimalist theme that would be updated regularly. 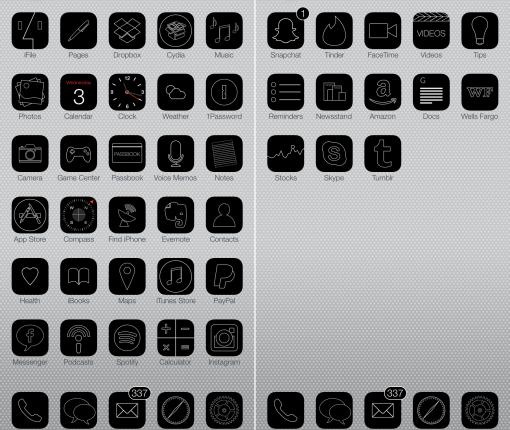 He started out theming the icons for free tweaks at first, and has plans on moving to paid apps as they’re requested. Changing little things about iOS is one of the neat benefits that comes with jailbreaking, whether it’s the Slide to Unlock text, or getting rid of different blurs in the UI. NoNotificationsText lets you change the text that says ‘No Notifications’ in the second tab in Notification Center. 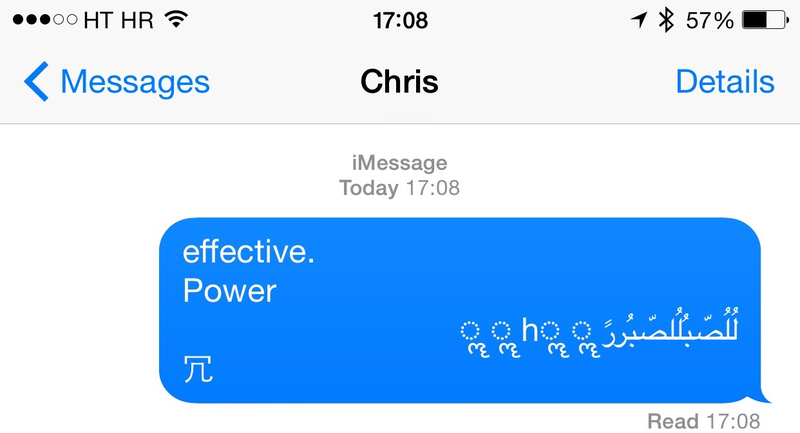 There is a new bug in iOS that resprings most peoples phones due to a low memory crash. It is caused by iOS’s inability to render certain strings of Arabic characters which overloads the memory, causing resprings and reboots or safe mode on a jailbroken device. Simply explained, when someone messages you those characters and you get a banner notification, your phone starts kicking the bucket. 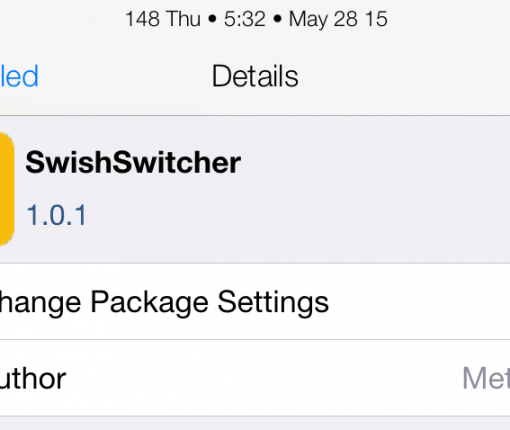 A few developers have stepped in and saved the day for jailbreakers. This isn’t the first or second time the jailbreak community receives a security fix quicker than Apple is able to push one to stock devices. It’s a great example of the argument that jailbroken iOS, in the right hands, can be more secure than stock. 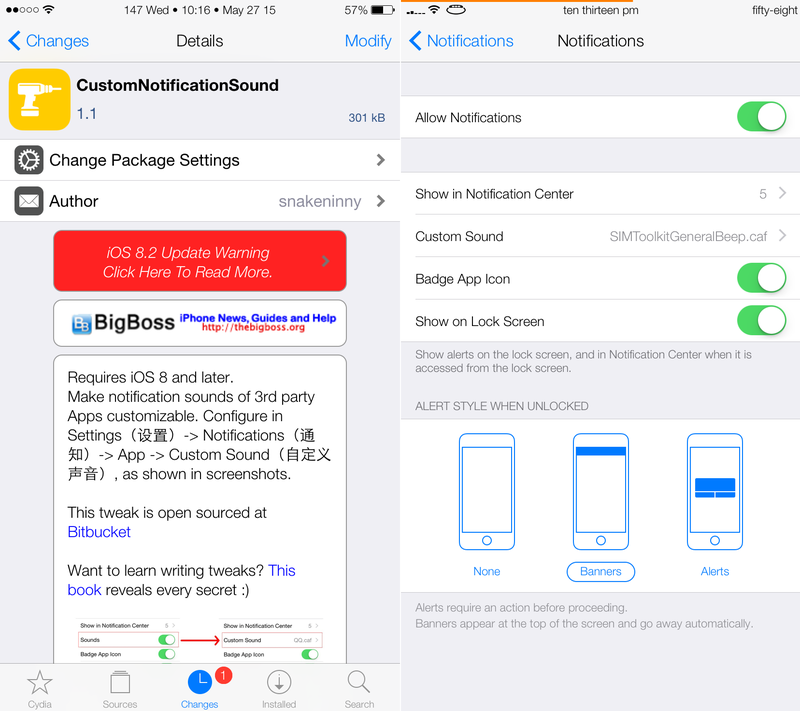 iOS isn’t known for its ability to be customized, so it’s no surprise that you can’t change the sound for third-party notifications without a jailbreak tweak. CustomNotificationSound by snakeninny, the developer who brought us LowPowerBanner, does exactly that. SwishSwitcher by Metion is one of those ‘why not’ tweaks that are released here and there in Cydia that just add a little fun thing to a small part of iOS. They seem to be mostly projects that developers undertake in order to learn more about developing. They can practice working with certain frameworks and passing information around by using Substrate to hook into Apple’s private API’s. There is also a lot more to learn about making a tweak than just coding it, and it’s a great accomplishment to set everything up and create a deb file. In this case the developer uses the ‘whoosh’ sound you hear when you hit Send from the stock Mail app, and calls it to play after a user has swiped up on a card in the App Switcher.